Malaysia has ancient rainforests, critically endangered primates and countless endemic species. 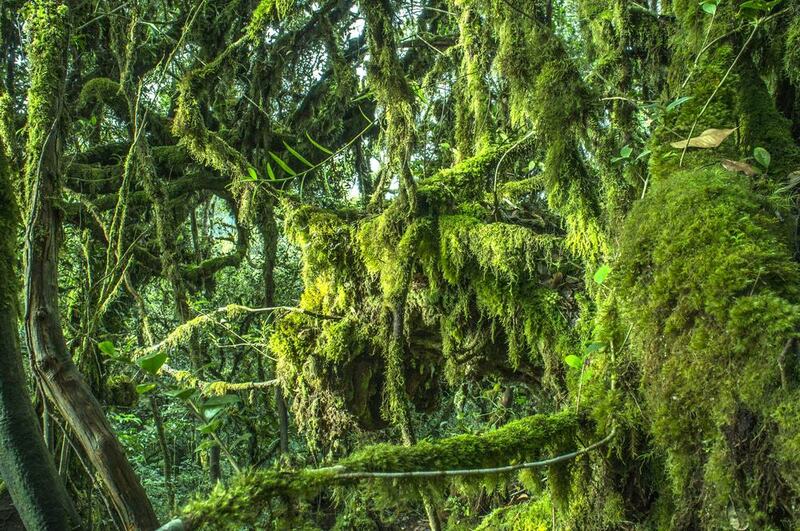 Over 15,000 types of plants, flowers and trees grow inside 130-million-year-old rainforests. Almost extinct Sumatran rhinos and critically endangered orangutans live inside the protected jungles. Endless fields of corals thrive in marine parks where millions of tropical fish call home. Green and Hawksbill turtles nest along parts of Malaysia’s thousands of kilometers of coastline. Ecosystems thrive in environments from primary rainforest to mangrove swamp to mountaintop habitats. Malaysia is a haven for ecotourists in Southeast Asia. The Crazy Tourist uncovers the 25 best ecotourism experiences in Malaysia for wildlife, trekking and diving. Primary rainforest covers vast areas on both Peninsular Malaysia and Malaysian Borneo. Marked trails lead through parts of the jungle. This gives trekkers the chance to get face-to-face with this biodiversity melting pot. Some parts of the forest are reachable within minutes of the city center. Kuala Lumpur’s Eco-Forest Park, Penang National Park and Kuching’s Bako National Park are examples. 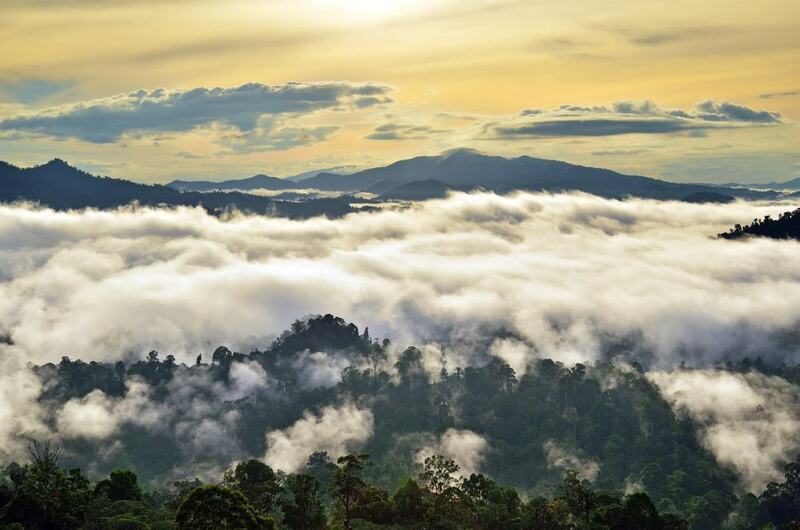 Others are more remote taking hours, if not days, to reach like Danum Valley and Maliau Basin in Borneo. 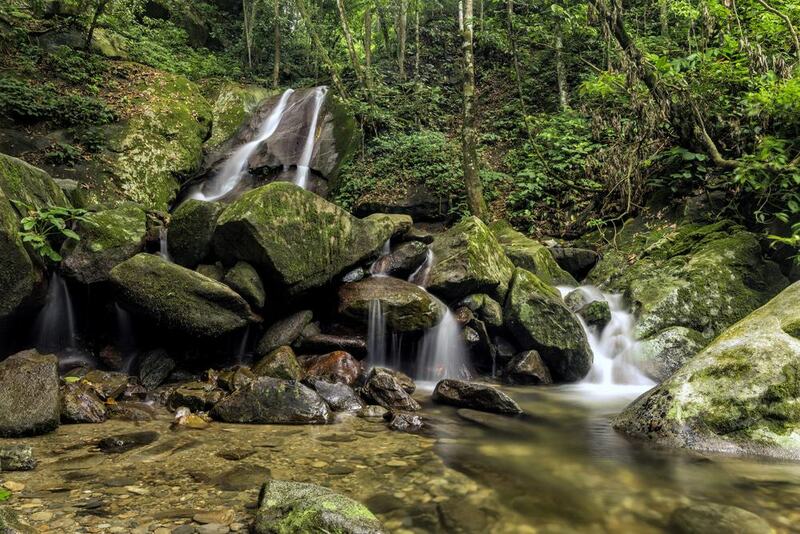 Malaysia has more than 25 national parks, forest reserves and nature reserves. The protected areas house millions of species of plants, animals and marine life. Escape civilization and embrace a few hours without Wi-Fi and phone signals. Look for rare species such as orangutans and pygmy elephants in their natural habitats. 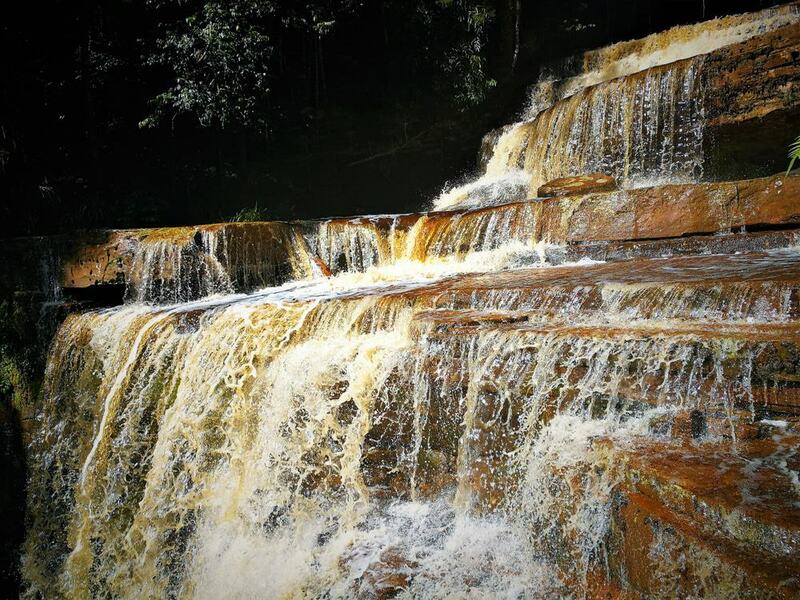 If you’re in Peninsular Malaysia, head to Taman Negara, Matang and Royal Belum State Park. 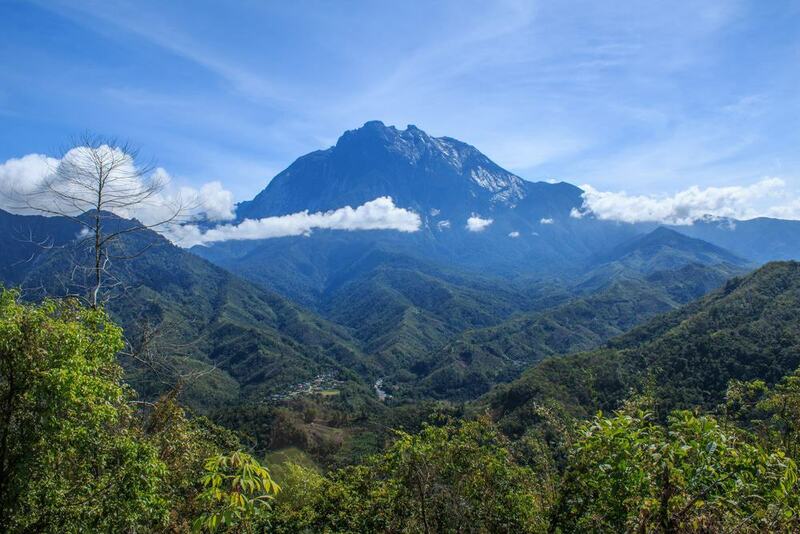 Check out Kinabalu Park and Gunung Gading National Park in Borneo. Orchids are Malaysia’s most characteristic flowers. The tropical flowers form a sea of color against a patchwork of green jungle. Keep your eyes peeled for the 800 species of orchids growing in Peninsular Malaysia’s rainforests. A whopping 2500 are found in Borneo. 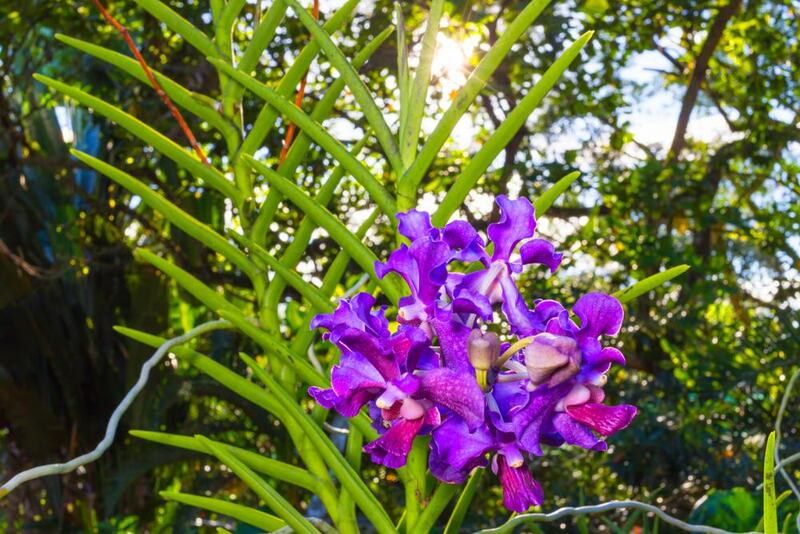 Follow almost any jungle trail and you’ll spot these colorful flowers. Guides will point out orchids in various stages of bloom. Purple bamboo orchids blossom along the streets in some of Malaysia’s cities too. 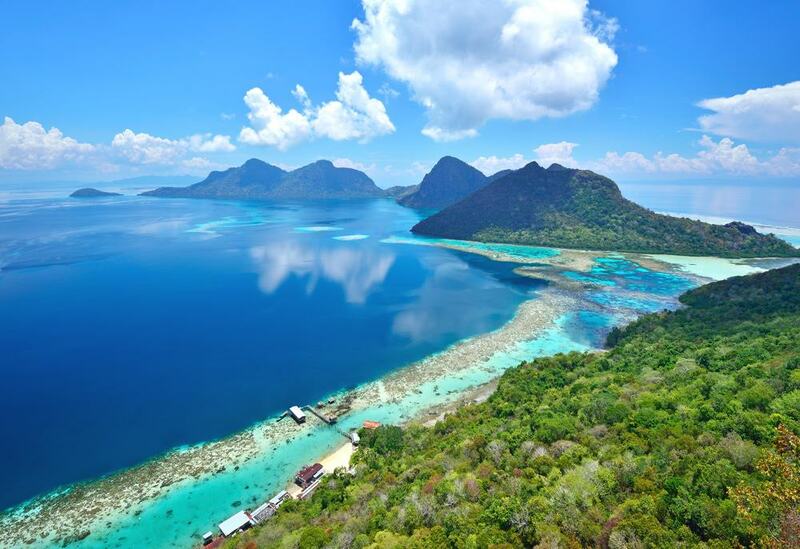 Malaysia has more than 900 islands scattered around the coasts in both Peninsular Malaysia and Malaysian Borneo. Some cater more towards tourism like Langkawi and Penang Island. Others are protected such as Sabah’s Tunku Abdul Rahman Marine Park and Sipadan Island. Travelers can choose between having the home comforts. Or getting off-the-grid for a few days on a desert island. Most of Malaysia’s islands have their own mini-ecosystems. Sapi Island near Kota Kinabalu has dozens of enormous monitor lizards roaming along the shores. Pulau Tiga in Sabah provides a nesting ground for thousands of sea snakes. Mega-diverse refers to a region with a vast number of endemic species and a big chunk of Earth’s plant and animal species. Malaysia belongs to this classification with 16 other countries. The nation has diverse landscapes from primary jungle to marine habitats to freshwater ecosystems. Malaysia’s coastline stretches for thousands of kilometers. Several mountains soar over 2000 meters (6562 feet). Travelers can go island hopping, jungle trekking and caving. Or hike in murky forests and cooler climates in Cameron Highlands. Biodiversity oozes from every corner of the country. Plants consuming bugs and small animals isn’t something out of science fiction. 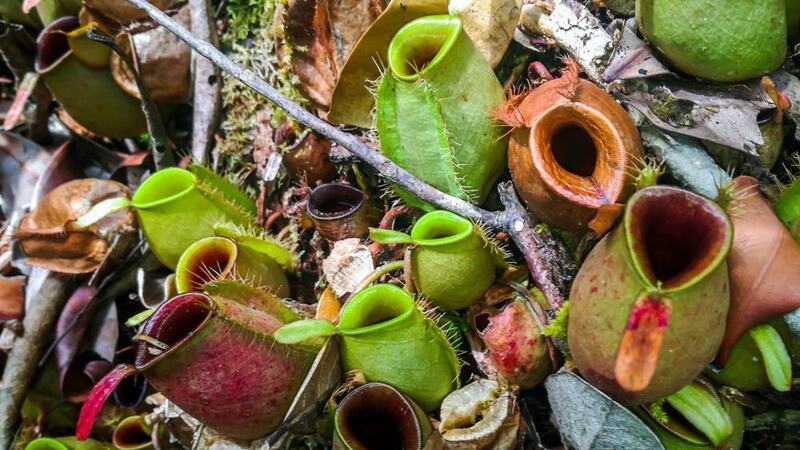 Malaysia’s alien-like pitcher plants really are meat-eating plants. Pitchers look like an enormous upside-down bell. They hang from trees and release a sweet odor. This scent attracts insects. When the bug enter, the pitcher plant’s sticky interior traps and ultimately digests them. Some of the larger ones in Borneo are known to consume small mice. Borneo has more than 50 species of pitcher. You can see these weird species in Kinabalu National Park, Gunung Mulu and Danum Valley. Hornbills are some of Earth’s quirkiest tropical birds. From a distance, they look like they’re out of a cartoon with their huge eyes and characteristic double-decker beak. Out of the world’s 54 types of hornbill, ten species live in Malaysia. Eight of these are in Sarawak. The rhinoceros hornbill thrives inside Sarawak’s jungles and features on their state emblem. Travelers can see these majestic birds flying above the canopy or perched on tree branches across Malaysia. For a more personal encounter, The Crazy Tourist recommends a trip to Pangkor Island. The owner of Sunset View Chalet feeds dozens of Oriental Pied hornbills every evening at 6:00pm. 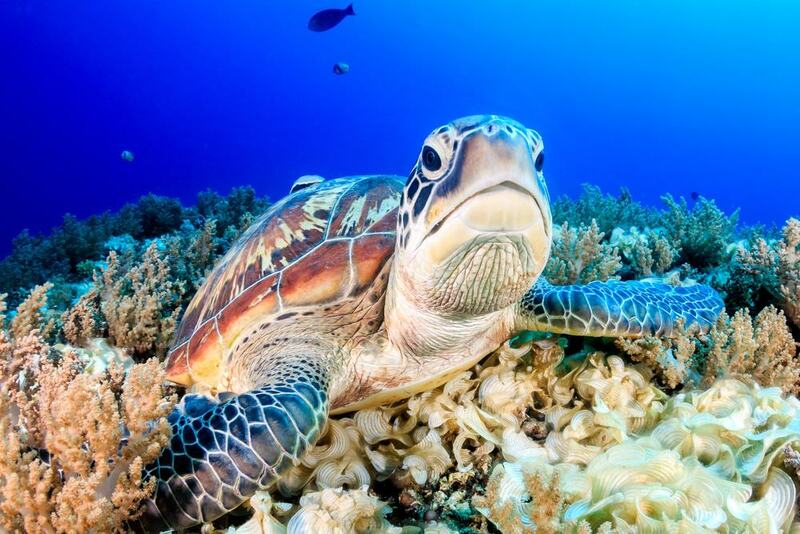 Both green and hawksbill turtles live in the warm tropical waters of Malaysia. Some turtles nest on certain beaches as others swim openly in the sea. Malaysia offers a high probability of meeting these sea turtles. Nothing beats watching these endangered marine critters break out of their shell and make their life-or-death dash towards the sea. Check out Turtle Island Park in Sabah, Tioman Island in Pahang and Sarawak’s Talang Satang National Park. Nesting usually takes place at specific times of the year. If you don’t see the baby turtles, you might still be able to watch adults swimming in the water. 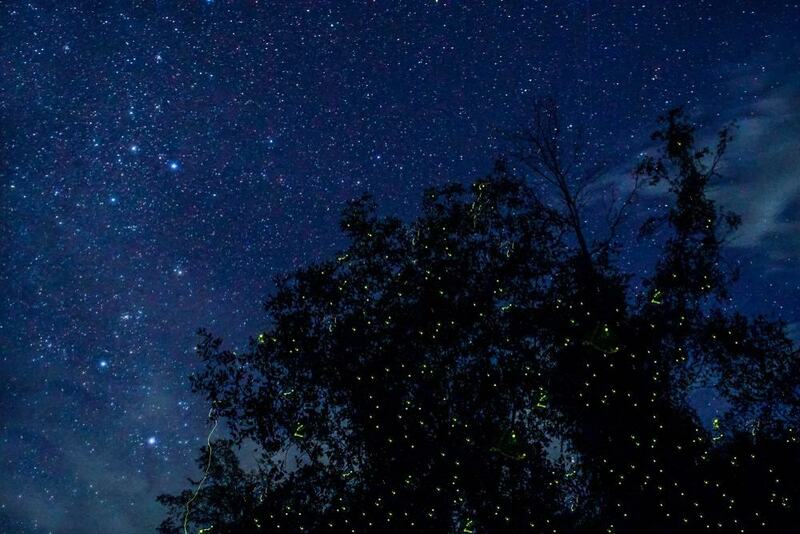 Malaysia provides the chance to watch fireflies dance in the inky darkness. Boats take passengers out to areas where these mysterious bugs thrive. Sit on the boat and watch in amazement as thousands light up the sky. Several places offer this type of ecotourism experience in Malaysia. 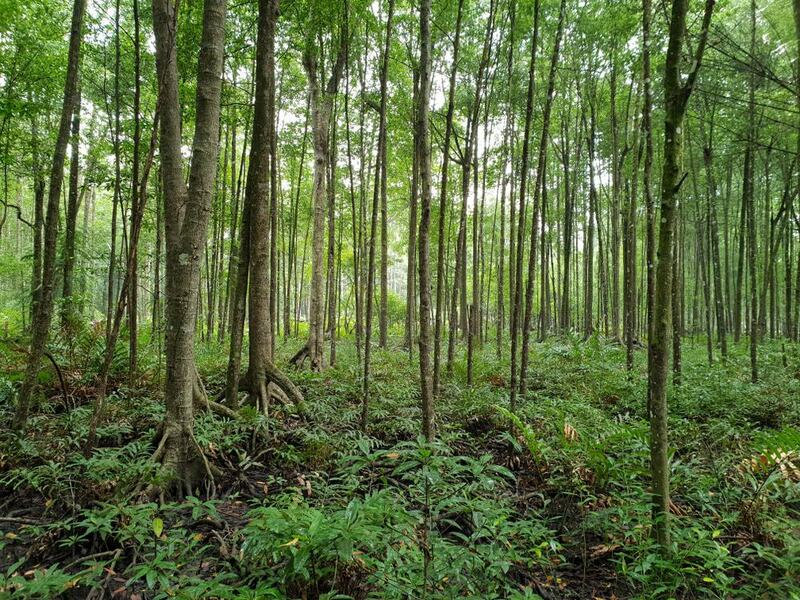 The Crazy Tourist recommends visiting Matang Mangroves near Taiping in Peninsular Malaysia. Or head to Kota Belud in Sabah. 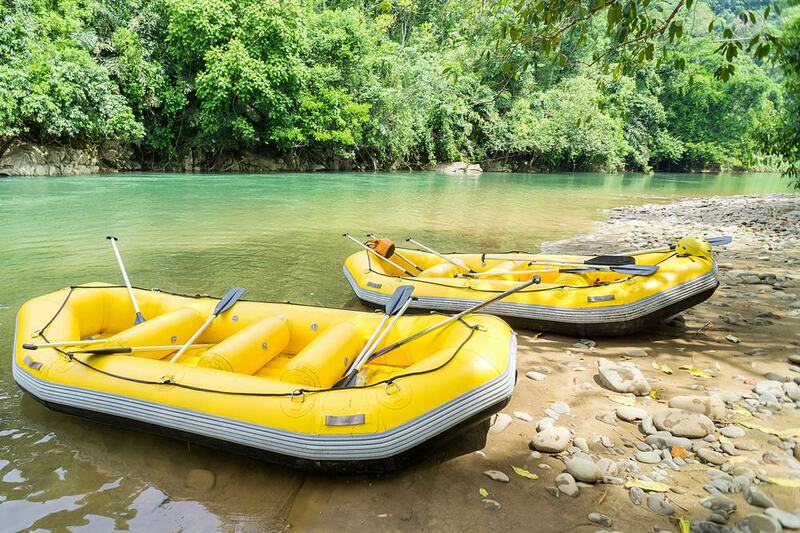 Rafting through Malaysia’s verdant landscapes is a once in a lifetime opportunity. Travelers can follow a series of rapids along the Kampar River in Perak. Instructors guide beginners over level one rapids. The more experienced can take their pick from half a dozen level two and three rapids. Jungle surrounds both sides of the meandering river. Monkeys often sit in the trees while sambar deer root around the undergrowth. Keep your eyes open – Spotting wildlife is almost guaranteed. Mangroves are Earth’s most underrated biome. The sprawling forests play a crucial role in local ecosystems. Nothing showcases Malaysia’s mangroves better than Matang Forest Reserve in Perak. Matang is Peninsular Malaysia’s longest stretch of intact mangrove. The swampy environment sprawls almost 400 square kilometers and houses up to 80,000 migratory birds. River cruises navigate the maze-like channels of these spooky mangrove forests. Guides point out primates, local habitats and different species of birds. Redang Island in Terengganu combines sugary beaches and luxury accommodation with almost perfect diving conditions. Aspiring divers can get PADI-certified and learn the basics in Redang’s paradise-like environment. The experienced will submerge into a magical marine world filled with fish of all shapes, sizes and colors. Book a few nights in the beachside bungalows and join a tour to the handful of sites surrounding the island. Or grab a snorkel and swim around the shallows near your bedroom window. Fly to Kuala Terengganu and take the 90-minute ferry to Redang Island. The islands close between October and March during the monsoon season. Mount Tahan stands at 2187 meters (7175 feet) in Pahang State. Mountain trails lead through ever-changing landscapes and habitats. The path starts in primary rainforest. Hikers meet primates, tropical flowers and billions of supersized insects. Trek higher and pass rivers and mountain ridges. Watch as the sights, smells and sounds slowly transform around you. Stand at the peak as clouds roll like a gentle sea below. Mount Tahan isn’t for the light-hearted. The fittest of hikers take at least four days to get there and back. 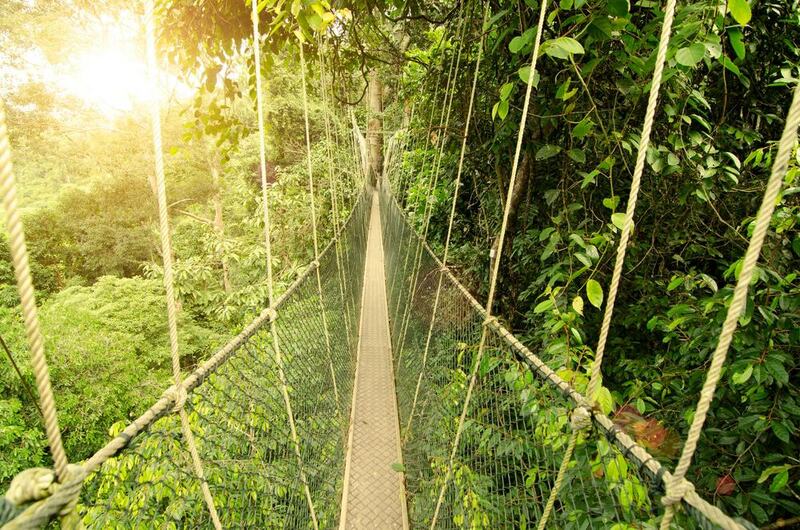 Tourists associate Malaysia with steamy tropical jungles. But Cameron Highlands in Pahang provides a very different type of forest. Rather than the sticky jungle, Cameron Highlands has hiking trails in a much cooler climate. With an altitude falling between 800 meters (2625 feet) and 1600 meters (5249 feet), the ecology and wildlife up here are different from the lowlands. Peacock pheasants root around the foliage. White-throated fantails sing in the trees. Endangered Sumatran serows are occasionally spotted near the trails. White and purple orchids add color to the spookier parts of the forests. Langkawi attracts millions of tourists looking for a beach holiday. But only a handful seize the chance to visit the sprawling mangrove system in its northeast corner. Kilim Karst Geoforest Park contains a vast network of mangroves, hidden lagoons and caves. The region covers approximately 10% of Langkawi Island with swimming macaques, circling eagles and countless fish. Tours leave from Pantai Cenang (Cenang Beach) daily. Boats first head out into the sea before passing through the mangrove maze. Next, you’ll visit caves, a fishery and eagle feeding sites. 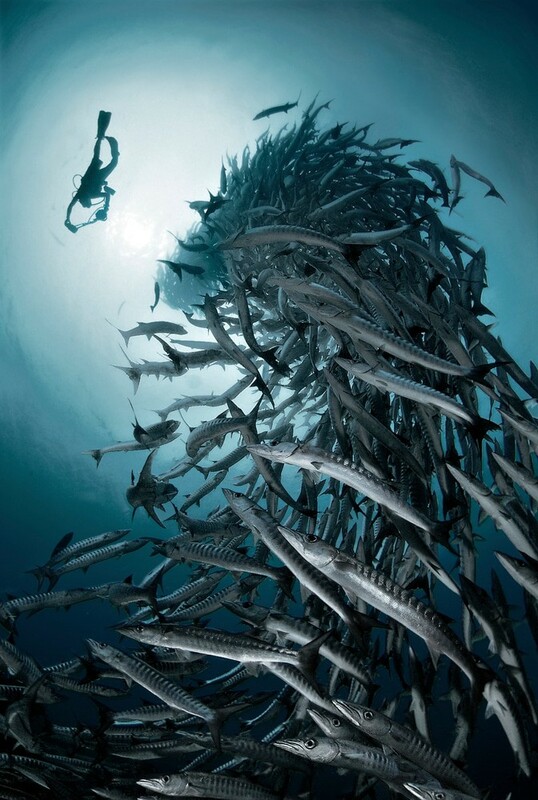 Sipadan Island consistently ranks among the planet’s best diving sites. 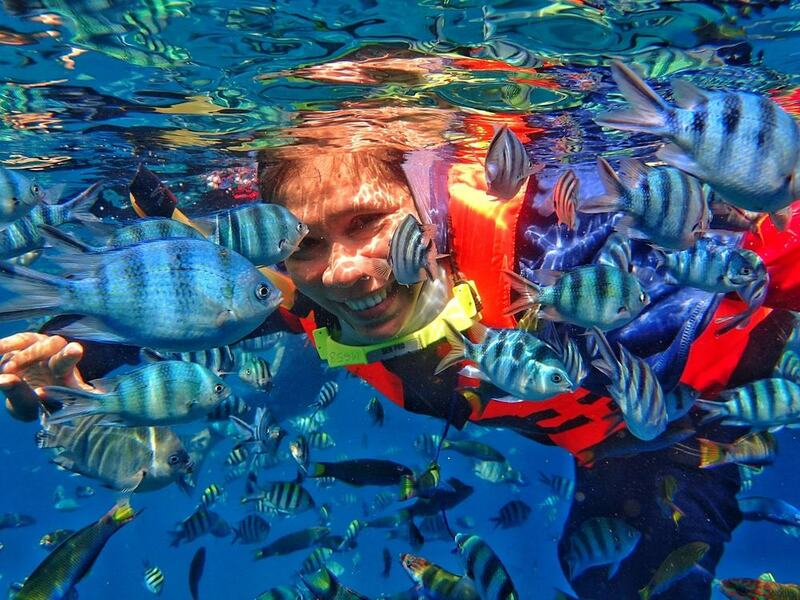 Get out into the crystal clear water and find a marine world unmatched in Southeast Asia. Thousands of tropical fish including mantas, sharks and Barracudas that are bigger than you swim around the waters. On the surface, endangered green and hawksbill turtles float towards the horizon. Sipadan Island issues 120 permits per day. Activities that interfere with the ecosystem are restricted. Getting to the islands takes time. But it’s worth it for the interaction with such diverse marine life. Fly to Tawau in East Sabah and take the bus to Semporna. Ferries go to Mabul Island where most divers stay. A 20-minute ferry connects Mabul and Sipadan. Mount Kinabalu is the tallest point between Papua New Guinea and the Himalayas. At 4095 meters (13,435 feet), it’s a mountaineering paradise. 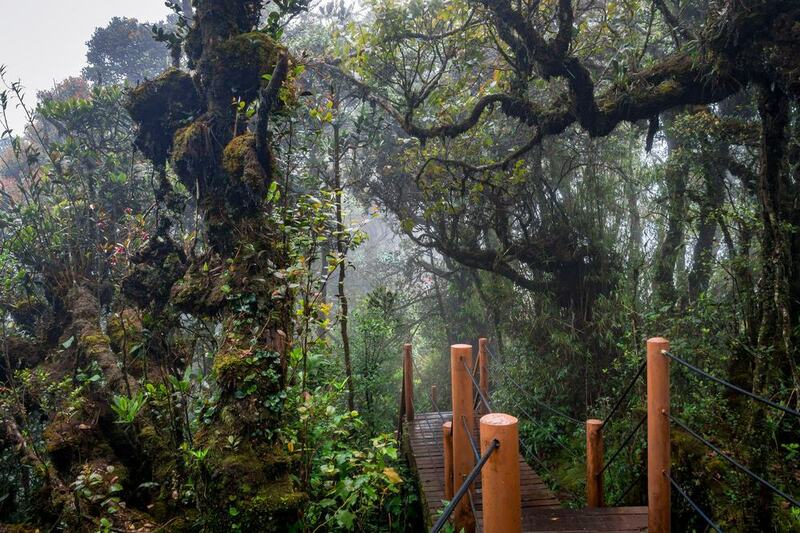 Trails start in Timpohon and rise to Laban Rata where hikers spend the night. Trekking starts again at 2:00am to reach the summit in time for sunrise. 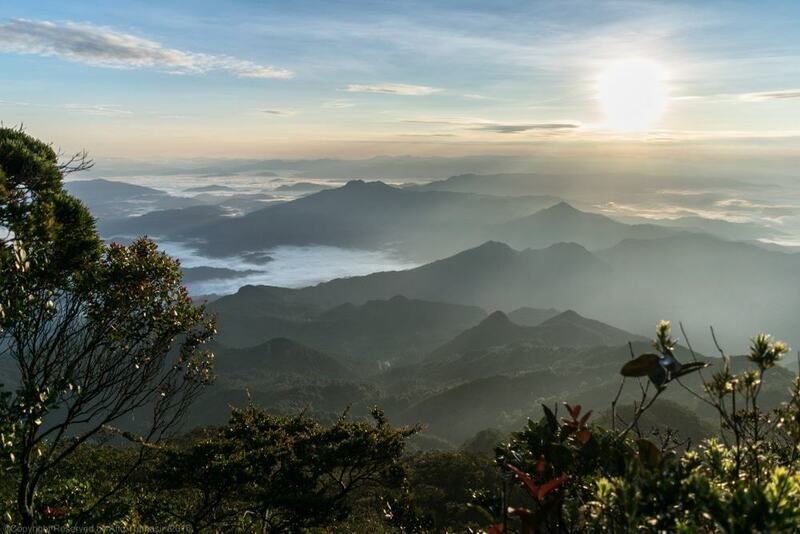 Climbing Mount Kinabalu isn’t just about getting out into nature and taking on the challenge. The mountain provides a window into Sabah’s ancient pagans. For centuries, Sabah’s indigenous believed Kinabalu was the final resting place of their ancestors. The mountain is still sacred today. Explore the changing habitats as you rise up this granite beast. Kinabalu Park surrounds Mount Kinabalu. The UNESCO-listed national park showcases Borneo’s world-famous biodiversity. Orchids and Rafflesia (the world’s largest and smelliest flower) grow inside Kinabalu Park. Almost 5,000 different species of birds, mammals and reptiles live inside the protected forest. What sets this area apart is how primeval and prehistoric it feels. Within minutes of entering, you feel completely isolated. Get a guide who can point out flora and fauna. The Crazy Tourist recommends combining a trip to Kinabalu Park with Mount Kinabalu. Spend the night in nearby Ranau. Coral Flyer Zipline combines an ecotourism treat with adrenaline pumping fun. 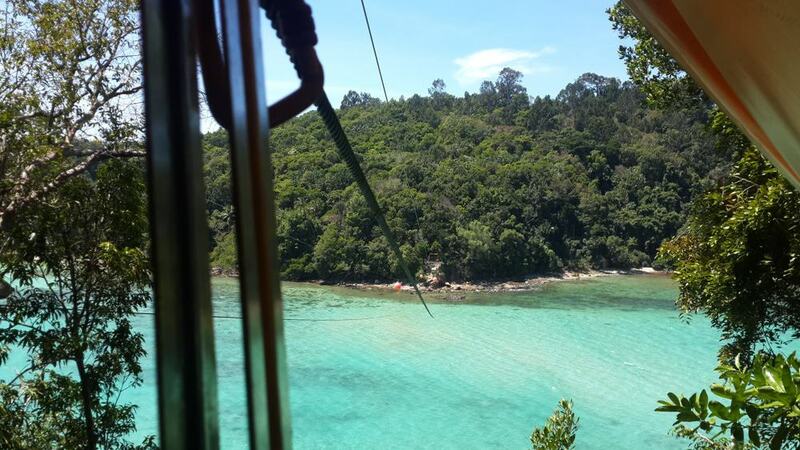 Starting in Gaya Island the flying fox stretches for more than 250 meters (820 feet) to neighboring Sapi Island. This is the world’s furthest island-to-island line. Strap yourself in and marvel at the stunning archipelago below in the azure sea. Listen to the howling monkeys cheering you on as you take the plunge and speed towards Sapi. Get your camera or GoPro ready -Hundreds of gigantic monitor lizards call Sapi Island’s beaches home. Sabah has dozens of rivers and streams creating jungle mazes. 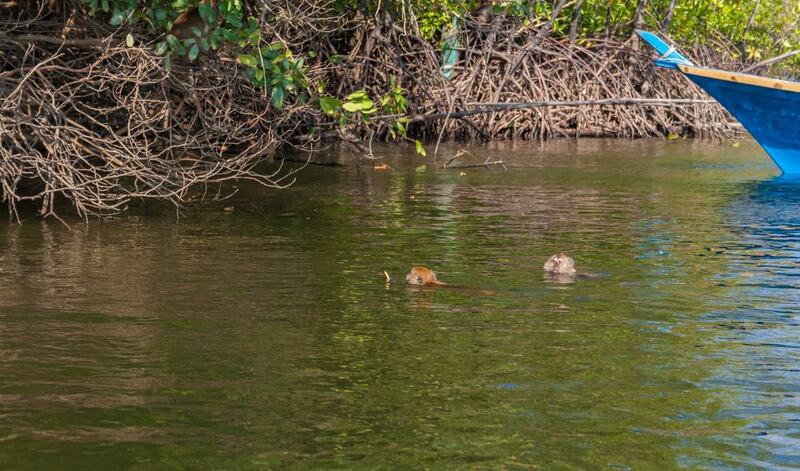 Getting out onto the water leads you closer to the troupes of monkeys and other wildlife. Rafting is the easiest (and funniest) way to get into these more secluded parts. Kiulu River in Tamparuli near Kota Kinabalu has a series of easy-to-medium difficulty rapids. Beginners can join a tour which meanders 15 kilometers (9.3 miles) along the river. The rapids split between level one and level two. Sit back, relax and watch the jungle pass by. 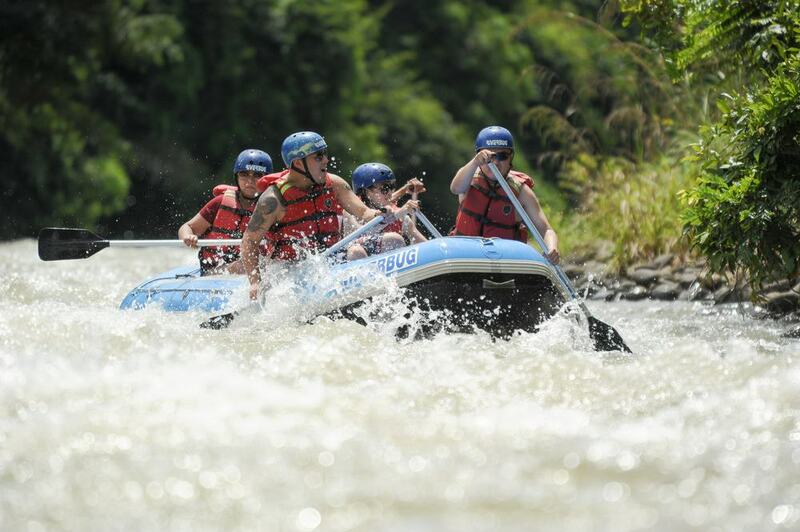 More experienced rafters can head to Padas River in Beaufort which promises a higher level of thrill-seeking fun. Mud volcanoes spew freezing mud from beneath the earth. These mysterious natural phenomena are found in only a few places including Azerbaijan, Taiwan and Malaysia. 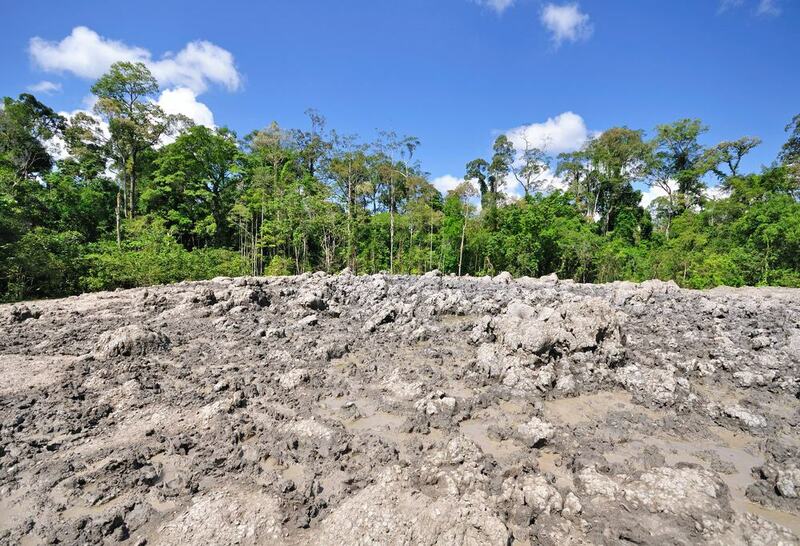 Sabah’s Pulau Tiga formed after a mud volcanic eruption. The island is more known for hosting the first Survivor series. Venture into the heart of Tiga Island and stand next to the bubbling mud spewing into ever taller towers. Explore the empty beaches, spend the night in a luxury bungalow or see nesting snakes on Snake Island. Maliau Basin is about as remote as it gets. The primary forest in central Sabah covers an area that’s almost the same size as Singapore. But only half of the forest has been mapped. More than 70 kilometers (43 miles) of paths pass through the bowl-like basin. Travelers can climb Mount Lotung and spend the night in a mountaintop hostel. Watch out for curious civets stopping by in the night. Follow the trails to waterfalls, natural pools and rivers. Scientists believe Maliau Basin contains several types of wildlife that have never been recorded. The strange looking bug or sweet-smelling flower next to the trail may not have a name. 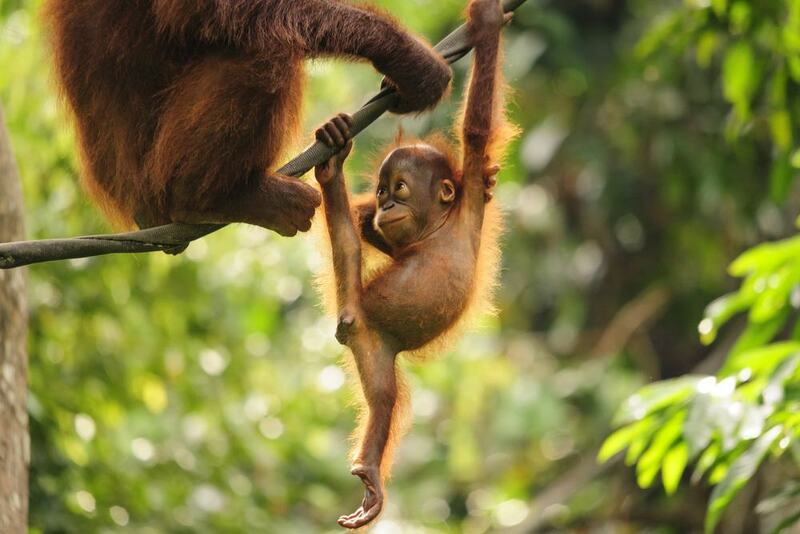 Orangutan numbers are rapidly declining in both Borneo and Sumatra. Only one-tenth of the population remains compared to 100 years ago. Borneo has large numbers of orangutans who either live in the wild or inside semi-wild rehabilitation centers. Coming face-to-face with these orange-haired primates is something you’ll never forget. Visiting a rehabilitation center is the easiest way to meet one. Head to either Sepilok in eastern Sabah or Semenggoh in Sarawak. Danum Valley, one of Borneo’s most remote reserves, has the world’s highest concentration of wild orangutans. Sometimes a family swings in the trees as you eat breakfast. 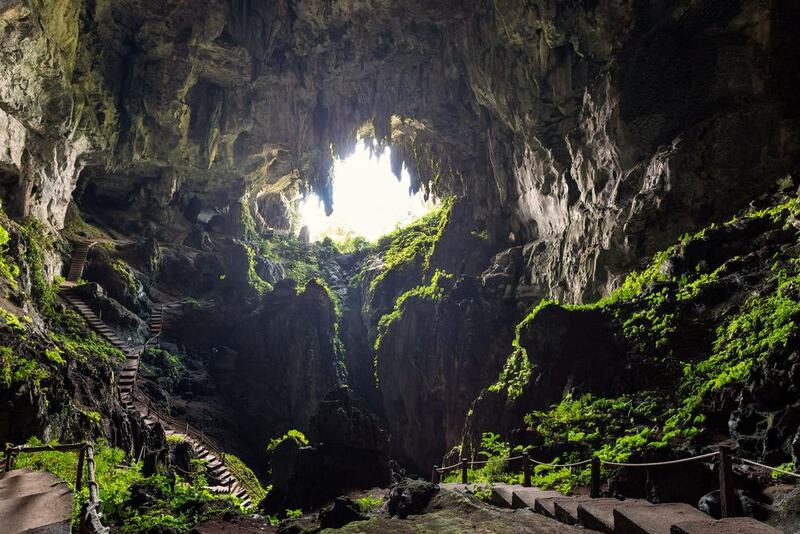 Sarawak has hundreds of caves. Most visitors go to either Niah or Gunung Mulu National Park. For a more rugged experience, check out Bau near Kuching. Fairy Caves located near Bau village has some of Malaysia’s best rock climbing. Hoist yourself over the limestone shelves and relish in the jungle surroundings. Explore the endless passageways and admire the geological wonders decorating the caves. Millions of squeaking bats lurk in the inky darkness. 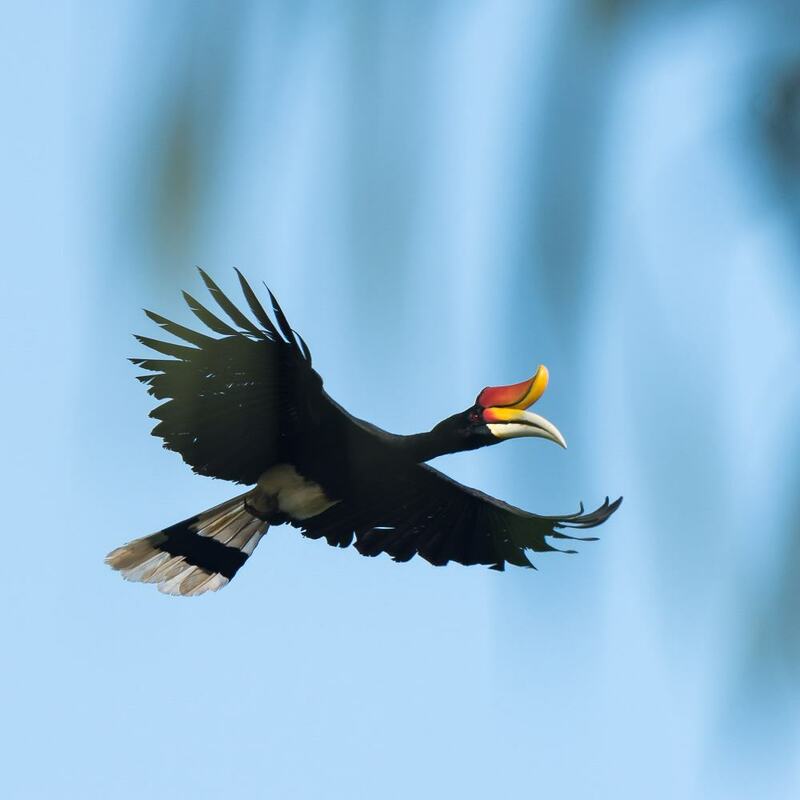 Rhinoceros hornbills glide high above the rocks and rainforest canopies. 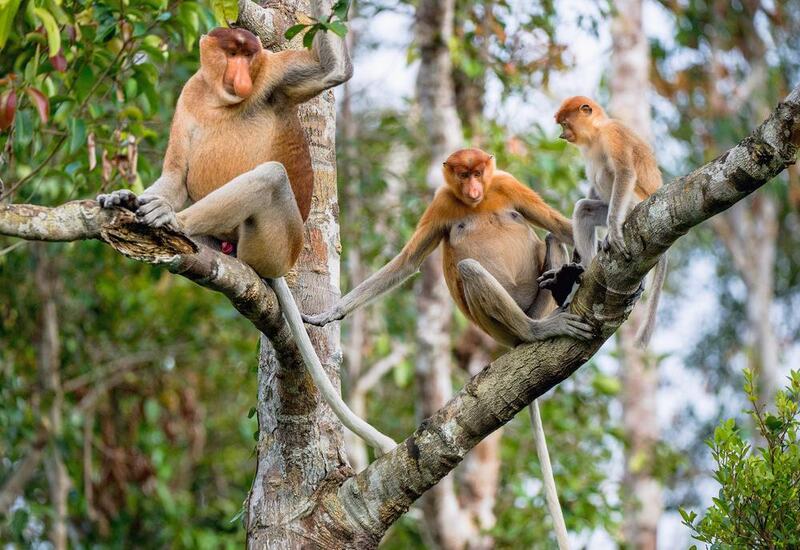 Proboscis monkeys are among the planet’s most endangered primates. Estimates suggest only 7000 remain. The monkeys endemic to Borneo have unusually long noses and round stomachs. Typically they hang around in small groups spread-eagled between tree branches. Take advantage of seeing these rare creatures in their natural habitat. Head to Labuk National Park, Kinabatangan River or Beaufort in Sabah. Or check out the small community living near Bako National Park HQ in Sarawak.